Three-time San Fernando Junior Calypso Monarch Rivaldo London sings his winning number Tomorrow at the San Fernando City Hall on Monday. Rivaldo London, 16, continued his winning streak on Monday when he captured the San Fernando Junior Calypso Monarch title in the secondary schools category for a third consecutive year. London is the younger brother of Renaldo London, a former winner of the competition who has been impressing audiences at the Kaiso Showkase Tent at Palm’s Club, San Fernando, with his 2018 offering Tomorrow, written by his uncle Brian London. 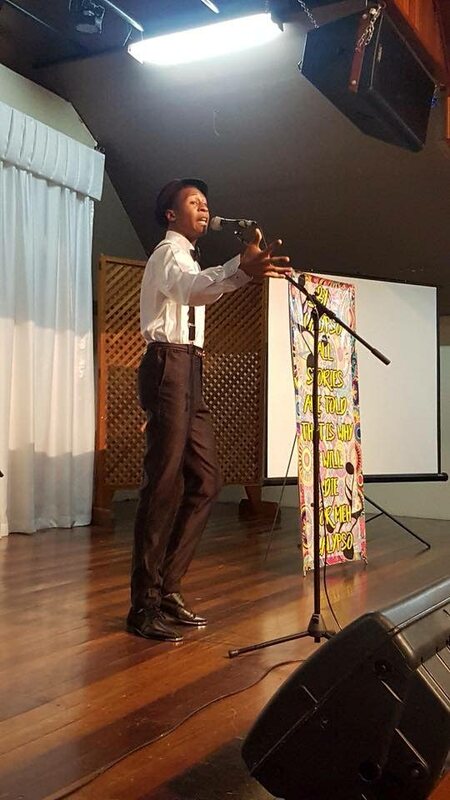 Singing in the tenth and final position, the fifth-form Iere High School student, who has been performing and winning since he was a first-year student at the Fyzabad Presbyterian School, soared ahead of the other nine competitors with a song also penned by Brian London. The composition, Die for Meh Calypso, tells of his love for calypso and the difficulty his peers have in understanding his passion for this indigenous art. “Calypso is old-people music, so why are you singing it, why you wasting your time/When you could sing dance hall or R&B or soca to make the girls wine,” the first verse says. “Love for country is all I know/I will die singing calypso,” was his reply. At the end of the competition, San Fernando Mayor Junia Regrello said he was happy to address the audience at the city auditorium after London’s performance. He said the song had all the makings of a good calypso, such as melody, lyrics, musical arrangement and presentation. He called on songwriters to be mindful of the components of a good calypso and not be selfish and write for themselves. London’s closest rival, Kevan Calliste, placed second with a song titled Back to de Days. Calliste, the grandson of calypsonian Black Stalin (Leroy Calliste) is a former Junior Calypso Monarch and National Extempore (juniors) winner. Marcus Mc Donald, performing a patriotic song called Mother Trinbago, earned the third spot overall and first place in the primary schools category. Mc Donald attends San Fernando Boys’ RC Primary. Second place went to Cindy Ann Bigford of his sister school, St Gabriel’s Girls’ RC. Her song, Stop Domestic Violence, placed the spotlight on the troubling issue. Another heavy topic, that of bullying, was what Kai Anthony Salazar chose to explore as his theme and for this, the St Michael’s AC School student was rewarded with third place. Reply to "Hat trick for Rivaldo at Sando Jnr Calypso competition"